Black Cab Weddings is the new way to arrive in style. We focus on professionalism, quality service and attention to detail. We know how expensive weddings can be, so we have a fleet of pristine, executive-style vehicles available for hire at very competitive prices. It’s difficult to imagine a more important day where not only does everything have to be perfection, but it has to be very special and memorable too. The little touches are what you remember and our fleet provides the perfect solution for your perfect day. Dedicated to ensuring your arrival to the wedding ceremony is graceful, beautiful and in the relaxing manner that benefits such a special occasion. We will also assist in helping you to enter and exit the vehicle safely; supporting all involved, from the bride herself, her father, bridesmaids, mother and all other guests in attendance. Our exemplary standards and attention to detail have gained us an enviable reputation that others in London strive to achieve. Whether you want a reliable car to transport you or your guests to your big day or have been invited to attend a wedding, choose Corporate Black Cabs to take you to the event. Why not request an extra wedding car for your special day to prevent the spoiling of your big day? It could mean all the difference. Of course, this service is available for weddings and for special occasions such as engagements and anniversary parties. Our minimum charge is £195.00…..So why the minimum charge ? Also included in the cost is fuel, Insurance and drivers/staff wages. 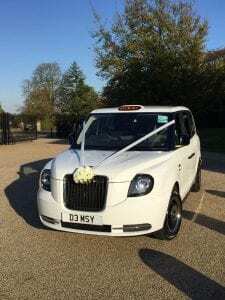 But the most important thing, your Wedding Black Cab is exclusively booked just for you on your special day, therefore if your running late, don’t panic, our driver will be in no rush.